The Fotron is astonishingly large, especially considering the features and quality--Basically similar to a 126 Instamatic (although introduced several years before the first Instamatic) with the addition of electronic strobe flash and electric winding. Like the Instamatics, film is paper-backed unperforated 35mm in a cassette--the Fotron uses Kodak's 828 roll film inserted in a proprietary cartridge rather than 126 Instamatic. Film was returned to Fotron for processing, and it is evident that the cartridge was meant for multiple uses. The cartridge comes apart with a single (proprietary) screw into a threaded metal insert. Rather than a film door, the cartridge snaps into the back of the camera. When you snap it in it automatically winds to the first picture. Operation of the Fotron is odd--Separate "indoor" and "outdoor" power buttons, then 3 separate shutter buttons marked Near, Medium and Far. You were instructed to push the appropriate power button, wait until the light in front of the lens flashed 5 times, then aim and push one of the shutter buttons. Bright sun at medium range was not recommended. When the camera is off, a flag blocks most of the viewfinder, a tunnel with plain plastic covers at each end, no optical elements. To preserve battery life you were asked to turn the camera off between shots. Charge time was 18 hours for a single roll of film, up to 72 hours. Internally, the camera is also unusual. Power is by a large 500mfd capacitor (roughly the size of a 4 oz juice can) at a relatively high voltage. I didn't measure it, but it was enough to give a significant tingle when I accidentally touched it. Mine is still working, although operating the camera it sounds abnormally slow and weak--I don't know if that is dried lubrication or weak power. A series of cams and levers operate the camera from a single motor on the opposite side from the capacitor. The lens is no bigger than an instamatic, appears to be a cheap 2 element with a plain clear cover on the front camera housing. Single speed rotary shutter, 2 position swing away aperture plate. Aperture and focus are controlled by the combination of shutter and indoor/outdoor control, with no compensation for actual lighting. Far, the lens does not move. Aperture plate is in for outdoor, out for indoor. Medium, the lens moves forward a bit, aperture out. Close, lens moves forward more than medium, aperture plate stays in lens. No shutter speed control, no exposure meter, no automatic exposure--what appears to be a metering panel around the lens covers a pair of neon lamps that indicate the flash is ready. According to what I've read, the flash always fired. Eventually there was a class action lawsuit saying that the camera was vastly overpriced, with an actual value around $40. Compared to cameras of the era that's probably about accurate, with most of that price for the flash. 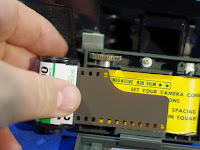 Have you ever figured out how to open the cartridge and put 35 mm film in it. I have a Fortron that seems to be working after I charge it, but I don't understand the locking mechanism on the cartridge. Did you ever figure it out? The lock is just a screw with a strange head. The hole in the back has a cone shaped screw with a slot in the side. The right sized screwdriver will fit the slot and allow you to unscrew it. I've done that, but I haven't threaded 35mm because I don't have a darkroom or changing bag any more. Thanks, I have seen that cone and slot, but it never occurred to me to try to turn it. I will let you know if I figure out how to load the film and it works out. Thanks. I recently purchased a Fotron III and was able to power it up with a bit of help from a 9V battery. Mine came with a film cartridge, which I reloaded with plain 135 film. I shot it on an overcast day to compensate for the ISO differences (Fotron expects 80 ISO film, which I could not find). I got 8 decent pictures (see here: https://c2.staticflickr.com/6/5627/30326016145_4323c19533_k.jpg). My Dad gave me a Fotron that is basically pristine but missing its snap load magazine. I found a factory loaded magazine and am anxiously awaiting its arrival. I’m hoping it arrives before my Dad snowbird to Arizona for the winter. I live about 400 miles from him and would love the chance to try out this awful camera with him. I can’t wait to tell him the door to door/class action suit story.